Will Wacky Fashions Make Golfing More Fun? Speaking softly on the links is understandable, but boring clothes is not the same thing. Tennis whites have been replaced by designer outfits, so why not follow the trend with golf pants? Scott Woodworth and his "bad" golf fashion business, Loudmouth Golf, are all about making golfing fun. 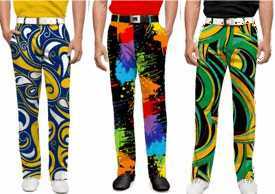 Loudmouth Golf specializes in "bad" golf pants for men. "The average golfer is too serious these days. The clothes they wear, khakis with a black golf shirt, lacks any creativity, individuality, and most of all, fun," says Woodworth. "Golfing is actually losing popularity because many players find the game and the golf courses too difficult and not much fun." In 2009, the outrageousness came into the national spotlight when several celebrities began to sport Woodworth's slightly obnoxious fashions. KNBR sports talk host and ex-NBA player Tom Tolbert wore bright yellow pants with polka dots at the nationally-televised American Century Celebrity Golf Tournament in Lake Tahoe. Dan Patrick from ESPN's Sport Center wore Loudmouth Golf pants. The new colorful pants were nothing if not attention-getting. Woodworth's motto "Play Loud" and have "Fun" may have been something that the golf industry needed to consider to attract and retain players. If everyone's eye was not on the birdy then they certainly were on the pants! Today, Loudmouth pants, shirts, and caps are sported on golf greens coast-to-coast, most notably worn by golf stars, Olympic sports teams, and celebrities -- including Bill Murray, Will Ferrell, Alice Cooper and (who else?) Dennis Rodman who have all become huge fans. Loudmouth Golf Pants - Wikipedia - Read all about the start of Loudmouth Golf by designer "Woody" Woodsworth and the influence it has had on sports fashion. Golf Review Guy - Loud Mouth Apparel - The look and feel, with photos.